Shelby Baron has competed for UA since 2014. 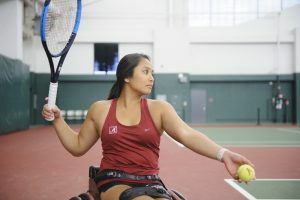 The Professional Tennis Registry has named University of Alabama wheelchair tennis player Shelby Baron the PTR Wheelchair Professional of the Year. Baron, who will complete her master’s in speech pathology in May, is currently ranked No. 40 in singles in the world and No. 2 in singles in the United States. A certified coach since 2013, she has competed in wheelchair tennis for UA since 2014 and has won three team national championships. Baron represented the United States in the 2016 Paralympics. Baron will receive the award during the PTR International Tennis Symposium, which will be held from Feb. 11 through Feb. 15 at Hilton Head Island, South Carolina. Baron, 24, hopes to compete in the 2020 Paralympics in Tokyo. She said her tennis ability has improved in the past year through consistent training with UA coaches. The Honolulu native wants to influence wheelchair tennis players the way her coaches have helped mold her game. To learn more about Baron and the Adapted Athletics program, visit alabamaadapted.com.